"We have eaten meat on a stick ever since the caveman killed his first chicken. It was a simple logic. Bones make great handles." So said chef Sanjay Thumma, aka Vahchef, in a 2008 YouTube video posted around the time he sold his Chicago-area minichain Sizzle India, moved back to India, and went viral among the Indo-expat diaspora. 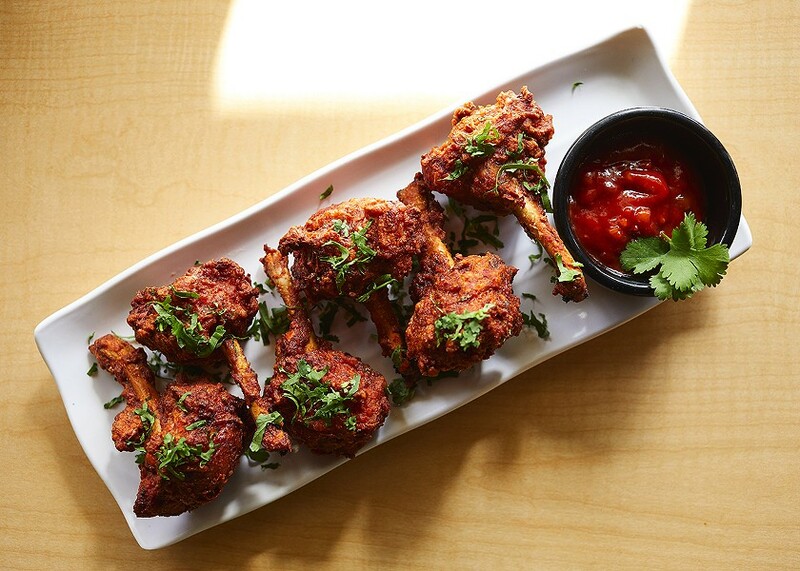 In the video—which at press time was clocking just over 1.4 million views—Thumma demonstrates increasingly Fieri-esque variations on Hakka-style lollipop chicken wings—chubby frenched drumettes first marinated in a masala yogurt, then battered and fried hard in a turmeric-and-chile-stained fry suit. 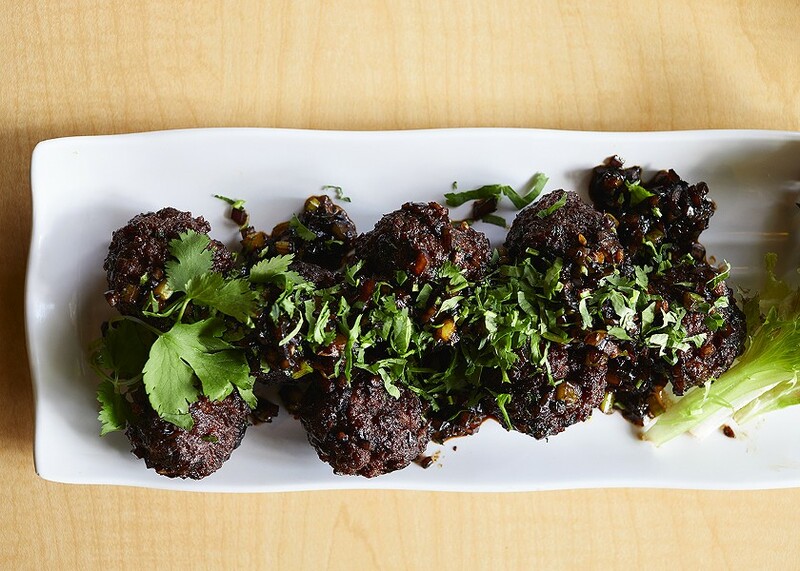 They're a product of the particular style of Indo-Chinese culinary cross-pollination that spread after ethnic-Chinese Hakka settled around Kolkata and native Indians started adapting the newcomers' food to their own tastes. 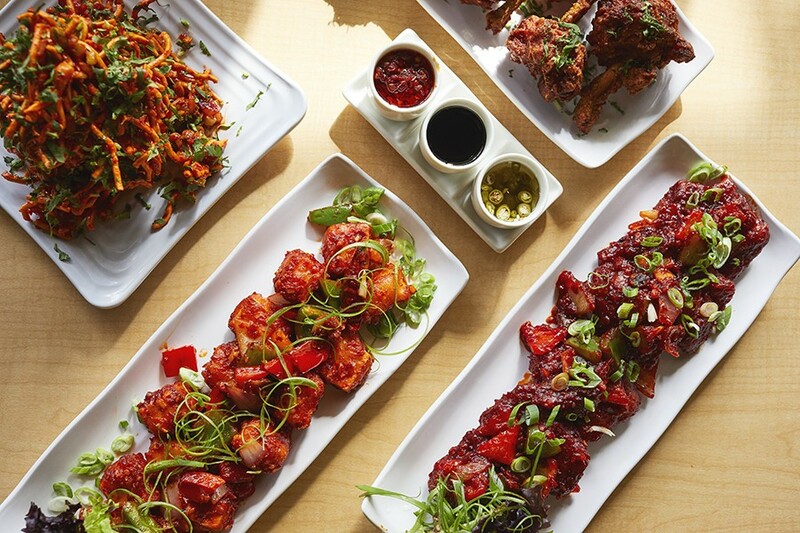 Many lifetimes later, Indo-Chinese food bears as little resemblance to Chinese food as Korean-Chinese food does, but the two share similarities, chicken lollipops being one of them. Gampongi, which according to WBEZ's Monica Eng were invented right here in Chicago at a couple of Albany Park restaurants (Peking Mandarin and Great Sea), are the analogue to Hakka lollipops. 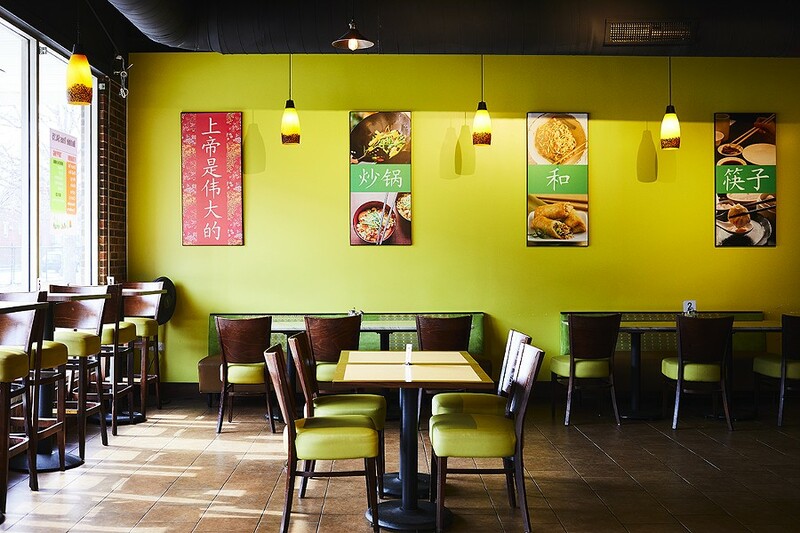 Sizzle India wasn't an Indo-Chinese restaurant, and if memory serves Chef Thumma didn't offer lollipops on Devon Avenue. 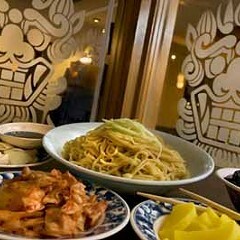 As far as I can tell, the first and only place within city limits ever to labor over them (and they are labor-intensive) is WokNChop, a year-old halal restaurant housed in a former White Hen, a bit less than a mile north of the birthplaces of gampongi. 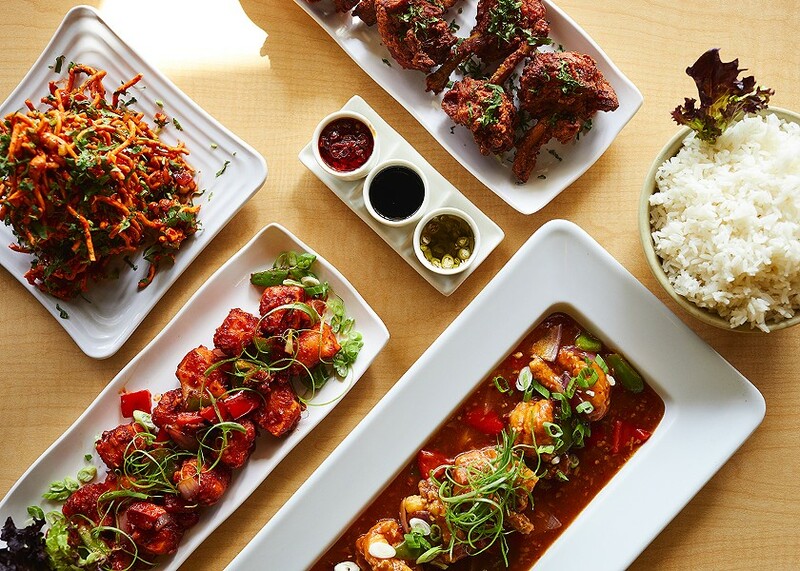 WokNChop is owner Mustak Hira's first (nonfranchise) restaurant, though his chef, whom he declines to name, has worked at Hoffman Estate's Bombay Chopsticks. 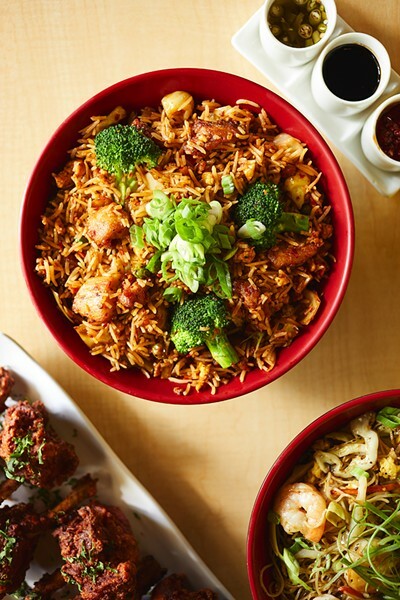 Their menu isn't as sprawling or indiscriminate as the latter's, the region's preeminent representation of Indo-Chinese, but there are some striking outliers, such as Thai-style coconut curries and pizza. It's a potentially bewildering variety, with not much to go on menu-wise, if you're unfamiliar with standards of Indo-Chinese; and it isn't particularly helpful, loaded with regional descriptors—Manchurian, "Schezwhan," Mongolian—that wouldn't be out of place on any typical Ameri-Chinese menu but are in fact specific to this style. Manchurian sauce, for example, bears some resemblance to the inky glossy sauces (glauces?) 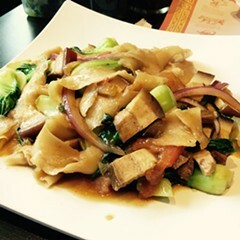 you might encounter at Great Beijing or Great Sea, not black bean, but soy sauce-dominated, with a hint of chile heat and not a lot of sweetness. It's a silky nightgown for ruddy lamb meatballs or lightly fried cauliflower, though you have to attack these early before their crispiness degrades into mush. The profile isn't dissimilar from the black- pepper gravy that blankets that tofu with fins, fried tilapia fillets, or lighter, almost fluffy chicken meatballs. Drier, lava-colored chile sauces, often tempered with honey, predominate on other dishes, like chewy nubs of paneer, crinkle-cut fries, or deep-fried baby corn cobs, which may be the only redemption of this otherwise dispiriting staple of the pan-Chinese culinary canon. 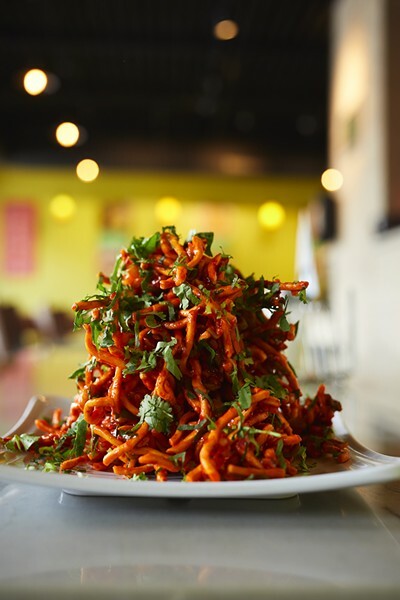 Maybe the most overt integration is the Indian street snack bhel puri, Sinicized with chow mein noodles that somehow maintain their crunch in a tomato-chile sauce. 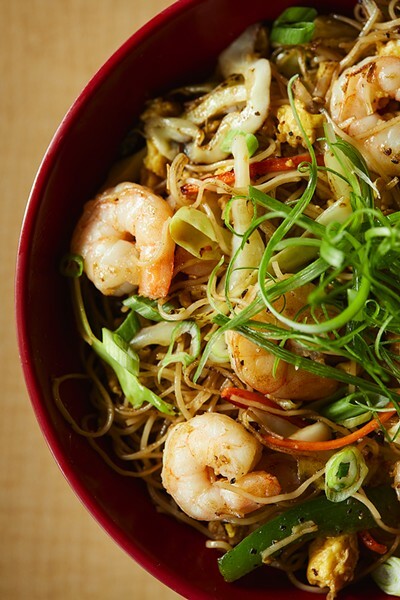 Noodles—variations of stir-fried, Hakka­style wheat noodles—and fried rice are distinguished by two particular options: one with crispy burnt garlic, and house style, which tinges the starches an attractive pastel green with mint, cilantro, green apple, and chile. But if it weren't for these relatively rare and notable items, WokNChop could stand alone on those fearsome-looking lollipops. If challenged to a duel I'd choose these sculpted cudgels of flaming chicken over the righteously gnarly gampongi, but that's deceptive. That turmeric-strained batter is crunchy and adhesive, but it protects a juicy interior, well preserved from the ravages of the fryer.